This might seem like an odd crossover at first, but it really makes quite a bit of sense. The adventure genre is one filled with all manner of puzzles. The two mechanics go hand in hand. And when you really think about it, Professor Layton and Phoenix Wright have a hell of a lot in common. Their stories are known for dramatic twists, wacky characters, and crazy amount of exposition in the closing moments. Honestly, it’s kind of sad it took this long to get such a crossover made. These two franchises seem made for each other. This game proves that. So how do you get these two characters together? Unlike something like Mortal Kombat vs DC Universe, it’s actually quite simple. Phoenix and Maya go to London on a lawyer exchange initiative. That’s it. Granted, the story is a bit more involved, but it’s nice to see a crossover that doesn’t have to stretch in order to get things to work. Central to the story is a young girl named Espella. Espella comes from a hidden city called Labyrinthia. In Labyrinthia, fantasy is reality. The town seems stuck in the middle ages. Knights patrol the streets, people use candles for light sources, and wagons are the hottest thing in transportation technology. Oh yeah. There’s also magic. Magic, it turns out, is very real in Labyrinthia. It can only be performed by witches. You might be able to see where this is going. Witchcraft is considered the worst of all evils, and women found guilty of being witches are dealt with in the “usual” manner. 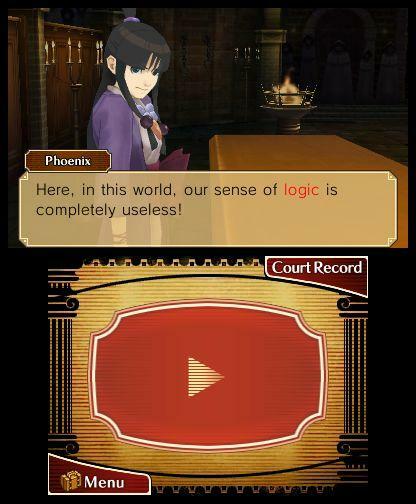 It’s up to Professor Layton, Luke, Phoenix, and Maya Fey to uncover the city’s mysteries and save innocent women from being burnt alive. If you are a fan of both franchises, this is like the best of both worlds. 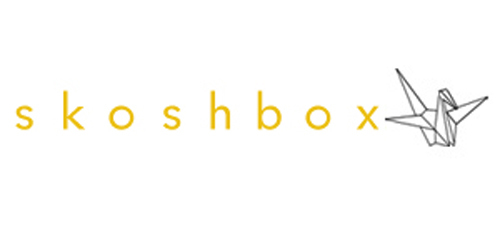 The writing is top notch, and blends the two styles together seamlessly. The story is at times intense, hysterical, and emotional. Whatever the game is trying to do, it succeeds at. You will laugh when you’re supposed to laugh, get pumped when you’re supposed to be pumped, and maybe even shed a tear when you’re supposed to cry. The character development is strong throughout. From the main stars to the tiniest of roles, each character is oozing with personality. Of special note is the town drunk, who continuously finds ways to put himself on the stand. If there’s one caveat, it’s that the game leaves a few questions unanswered at the end. It also gets really sappy. I’m used to these games having happy endings, but this one goes a tad overboard in my opinion. The story is an incredibly fun one to play through though. The strong writing and interesting characters will keep you glued to your 3DS for hours at a time. Visually, this game is a masterpiece. 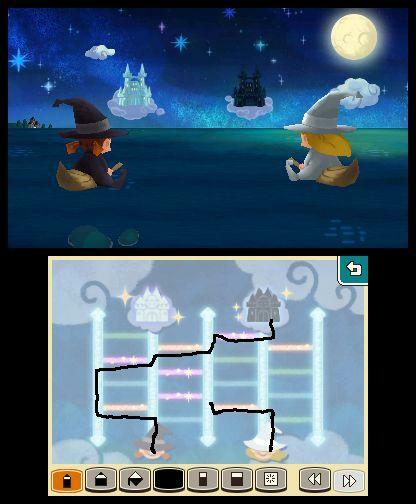 While Layton and Wright don’t quite match art styles, the city of Labyrinthia is a sight to behold. The colors are rich, the environments are detailed, and there’s a surprising amount of variety. The 3D effects are drop dead gorgeous. You’ll want to play the game with the slider jacked up for the entire length of the journey. Trust me on that. The environments were clearly designed with 3D in mind, and feature a terrific sense of depth. As you might expect, having a lawyer’s finger jump out of the screen when they raise an objection is a thrill in its own right. There are a couple of issues, however. First, the framerate can dip dramatically during certain animations. This happens usually when multiple characters are on the screen, and is disorientating when it happens. The animated cut-scenes, though beautiful, didn’t make the jump to 3D as well as the rest of the game either. 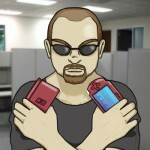 These are minor issues though, and are unlikely to affect your overall enjoyment of the game. This game has one of the best soundtracks I’ve heard in gaming. The exciting court room music we’ve come to know and love and been mixed with the Victorian flavored tunes of the Layton series to create a suite of fantastic songs. The main theme is so good that you might not bother playing the game until it’s over. As always, the music rises and dips depending on the action, adding to the feel of every moment in the game. Solid audio effects and talented voice actors round out the experience. I’m not a huge fan of Luke’s voice, but the quality is undeniably there. There’s actually quite a bit of voice acting in the game, though it’s reserved for the most dramatic moments. When you hear someone talking out loud, you know something important is going on. The biggest complaint that’s going to made of this game is that it doesn’t do all that great a job of merging the two gameplay styles. For the most part, that’s completely valid. 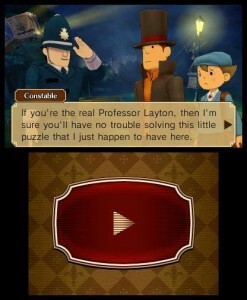 Layton’s exploration and puzzle solving sections are mostly separate from PW’s courtroom shenanigans. They kind of come together at the end, but it probably won’t be enough to meet everyone’s expectations. That being said, both gameplay styles are present and accounted for. In fact, the trials are some of the best yet. When it comes to puzzle solving and exploration, the game sticks to Layton standards. You move a magnifying glass around the screen to examine objects, locations, and characters. You can freely move between areas of the game via a map, collect hint coins for use in the game, and discover hidden puzzles. Eventually, you’ll need to solve a puzzle in order to move on. There are seventy puzzles in the game, and they cover the usual area. There are slide puzzles, jigsaw puzzles, logic puzzles, and more to get your brain working. You can use the stylus if you want. It’s preferable, but not necessary. The puzzles control well for the most part. The only issues I had were getting the game to differentiate between when I wanted to rotate a piece versus when I wanted to move it. The memo pad feature returns as well, and is great for drawing out your solution before turning it in. Once again, you’ll earn “picarats” by completing puzzles. You’ll get more for answering the puzzles correctly the first time, which makes it a good idea to answer only when you know you’ve got it right. You’ll also earn picarats for completing trials without getting penalized. You’ll want picarats in order to unlock goodies when you’ve beaten the game. During trials, your job is to comb through testimony in order to find contradictions. You can press witnesses in order to get more information on each bit of testimony, which may in turn unlock new testimony for you to counter. When you spot a contradiction, you’ll need to present evidence, which is easy to do. If you’re right, the trial moves forward in a new direction. If you’re wrong, you’ll lose a shield. If you run out of shields, it’s game over. You’ll have to start from your last save or from the beginning of the trial. New to this game is a mechanic wherein you cross-examine multiple witnesses at once. The key here is to pit the witnesses’ testimonies against each other in order to drag out inconsistencies. For example, one witness might say a character held a knife, and another might refute that claim. 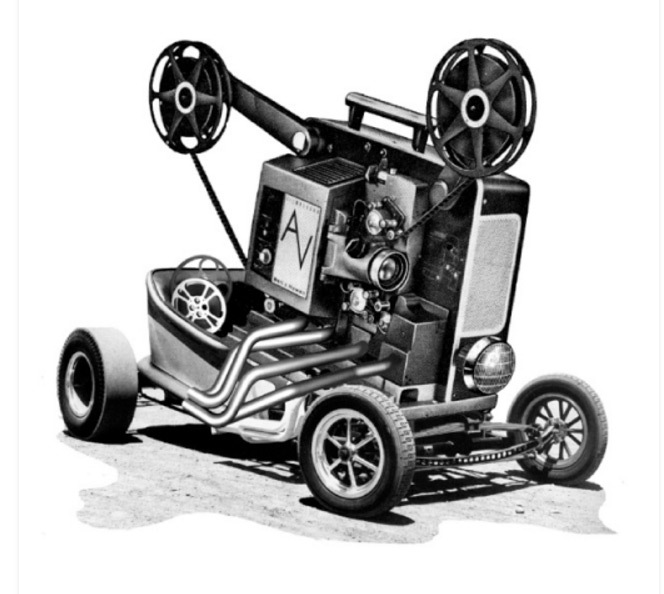 This works by pressing one witness and listening for audio cues from another. If you hear such a cue, you can switch to another witness in order to question them about what they’re thinking. It’s a nifty mechanic that allows for dynamic courtroom craziness. The game is broken up into ten chapters. All in all, you’ll find four court cases and seventy puzzles to work through. 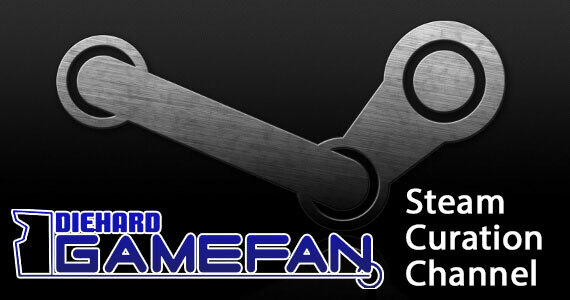 Obviously, these amounts are lower than you’d find in a specific game in each franchise. However, I find the ratio is solid. You’ll likely spend more time in the courtroom, however, as most of the major exposition happens there. Once the game is beat, you can go back to find missing puzzles and hint coins, but not much else. A gallery unlocks, allowing you listen to the soundtrack, watch the video, etc. You’ll also unlock the ability to play through special cases that will be added to the game over the course of the upcoming weeks. These cases are short visual novel sections, but each add another puzzles to the mix. The real draw is spending more time with the characters. Let’s examine some more of the game’s downsides before wrapping things up. If you were hoping for a major clash between both franchise’s colorful casts, you will be disappointed. Apart from a couple of brief cameos, the four main characters are the only representatives of their games. The game is also a bit easier than usual, especially since you can use hint coins during trials to show you where you need to press. Honestly, the game could do a better job of intermingling the two styles to create a more original experience. Instead, it kind of feels like the two series were pasted to each other. Still, the game is definitely a success. The story is downright good and a blast to play through. You’ll be hooked from start to finish. Combine that with gorgeous visuals, a phenomenal soundtrack, and plenty of solid gameplay, and you’ve got a pretty darn good game by any means. The downsides are more about some lost potential rather than an actual detriment to the experience. 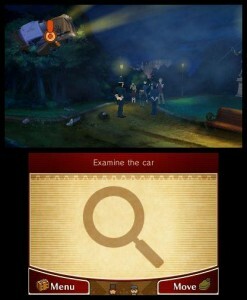 If you’re a fan of Layton, Phoenix, or both, this is one game you’re not going to want to miss. 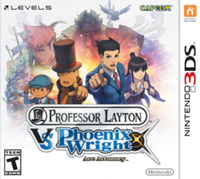 While it isn’t the smoothest of mixtures, Professor Layton vs Phoenix Wright utilizes the very best of both franchises to create an exhilarating adventure. It has the puzzles, the courtroom drama, and the wacky characters we’ve grown to love. The presentation and story are downright fantastic to boot. It’s been a long wait for North America to get this game, and the wait has most certainly been worth it. This is one of the best 3DS games so far this year. 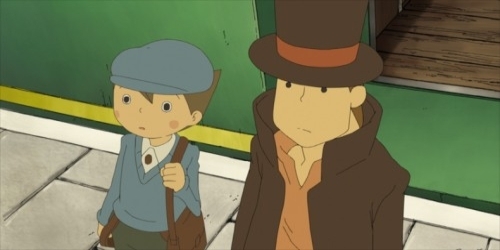 Catching Up With 2009: Professor Layton and the Diabolical Box!